This was Jill and Richie's last day before their flight to New York. The Romanesque town of Pavia looked very interesting and it was just an hour from Asti and half an hour from Linate. The Hotel Rosengarten is a tacky, low-end three star but that was more than compensated for by our enjoyment of the old town, which we spent the entire day exploring. The well designed town sits on the bank of the Fiume Ticino and maintains the atmosphere of its ancient past. Its imposing churches and castle, the landmark medieval towers and the university (one of the oldest in Italy) are of artistic and historical significance. The pedestrian streets and piazzas were filled with shoppers and university students enjoying a snack in this relaxing environment on the beautiful Fall day. The university impressed us with its large courtyards and arcades where students lounged while others sat and studied. We crossed the river on Ponte Coperto to stroll along the riverside and to investigate several restaurants. We found two to be interesting; both were small homey places, family run, Trattoria Ferrari and Antica Osteria del Previ. We chose the latter and made a reservation. Whenever we had an occasion to interact with the locals, we found them outgoing and anxious to help or just talk. Jill and Richie had wanted to reconfirm their flights and as we walked by Ticinum Viaggi Travel Agency on the main shopping way, Via Cavour 57, we decided to go in and see if they would help us. Our experience with travel agents in Europe, had accustomed us to instant rejection and sometimes even rebuke. Donato Sozzani was the opposite. He immediately got on the phone and made a long distance call to confirm the flights and then refused our offer of reimbursement. We were impressed to say the least and let him know it. We had a pleasant chat about our travels and left with an even deeper affection for this sweet town. Antico Osteria del Previ gets you roused as soon as you enter. A doorway to a huge, spotless, bustling cucina is to the left and straight ahead, outside the dining room which is to your right, is a display of antipasti. This would be really good, home style cooking of traditional foods. Melt-in-the-mouth potato and spinach gnocchi with a cheese sauce for everyone but me, faithful to my favorite tagliatelle con funghi porcini. Pollo in a red wine sauce and salt cod with tomato and onion were both served with a luscious polenta and the girls were quite pleased. The "gorillas" shared a "Texas Steak". It was fine quality beef cooked medium rare to tasty perfection, served with roast potatoes and arugula. The crumble crust ricotta cheese cake with currants on top had Jill and Richie raving. Linda and I were a bit more subdued about the pear with chocolate sauce and vanilla ice cream. Communicating with this friendly family was easy, despite the language barrier; the service was very good. In the morning, Jill and Richie dropped us off at the station. We don't see each other often enough, so it was tough to say good-bye, particularly after the glorious two weeks we had just spent together. 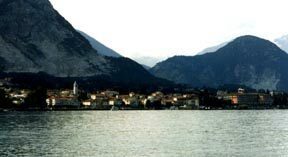 They would go back into town to do some last-minute shopping before returning the car to the airport and we were off to Stresa, by way of Milano, by train. We boarded the 10:25 from Pavia and arrived in Stresa at 12:40. Stresa is located on Lake Maggiore in northeastern Piemonte which borders Lombardia and Switzerland. It is a renowned tourist resort in a picturesque setting facing the equally famous Borromeo Islands. Cornelia and Fabio suggested this spot as one where it would be most convenient for them to pick us up to take us to their home. We were staying the night at the three star Hotel Du Parc, Via Gignous 1. If that place in Pavia was worthy of three stars, this hotel rated six! The location is high above the center of the town, with lovely lake views from the front rooms. Once a private villa, it has been beautifully converted to maintain the charm, elegance and comfort of the past. Two very nice ladies greeted us and had our luggage brought to our room while we dispensed with the passport formalities. The cozy lounge and the dining room are behind the reception area and the antique furnishings throughout are well-preserved treasures. Our lake view room and bathroom were nice size and inviting. A visit to Stresa is not complete without a visit to the islands. The walk through this adorable town was enjoyable and as we pulled away from shore on the tour boat, the view of the majestic lake front hotels bordering the promenade was stunning. Each of the three islands, Isola Bella, Isola Pescatori and Isola Madre is exceptionally beautiful. Isola Bella is aptly named and as the boat approached we were treated to the sight of magnificent gardens tiered upward from the lake; this ten tier masterpiece is unreal. The joy of anticipation would soon turn to disgust. As soon as we disembarked we were confronted by the granddaddy of tourist traps. The only streets, alleys and passageways you could navigate were wall-to-wall tourist shops and stands. The only other option was to get behind a long line of people waiting to pay to get into the Borromeo Palace and gardens. Maybe we missed something special, but lining up just isn't our thing. We hurried to get the next boat out of there and went on to Isola Pescatori. This small fishing village is lovely. It has it's share of tourist offerings but at least one can walk the maze of alleys and discover what life here is about. Back to Stresa to enjoy the promenade and yes, I forgot about a fourth gelato discovery, L'Angolo del Gelato, Piazza L. Cadorna 38, the real stuff! The hotel recommended Ristorante Triangolo, Via Roma 61, around the corner. After two weeks of glorious cuisine, we were not expecting too much in a tourist town. We were pleasantly surprised with a satisfying meal; the dining room was full for good reason. I ordered the house spaghetti, with mussels, clams, shrimp and asparagus. Despite the fact that the pasta was past al dente, I enjoyed it. Linda's ravioli stuffed with rabbit in a meat and mushroom sauce was very good, but she found the pasta too soft. The grilled beef steak in balsamic and white wine vinegar and onions (a splendid combination) was outstanding as was the veal chop in an orange sauce. We loved the roast potatoes. Our friends arrived bright and early, just after we finished a very nice breakfast and we bade farewell to Italy and drove up the road into Switzerland.